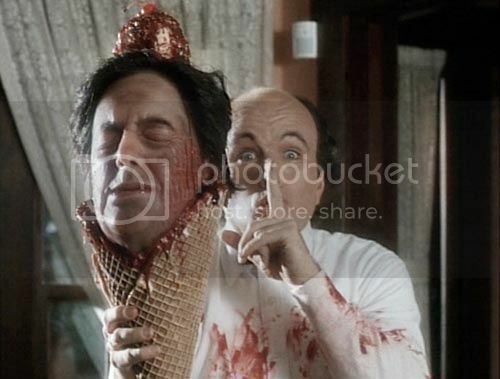 This is my second Terrible Movies for Terrible Individuals post and I decided to do it on the comedy horror Ice Cream Man starring Clint Howard. You're probably wondering, "Why is the movie terrible?" If you haven't seen this movie, you should be dancing with joy! It honestly takes a lot for me to think a film is completely TERRIBLE, and over the past twenty plus years, I have seen some real out-of-this-world-let-me-play-in-traffic films. 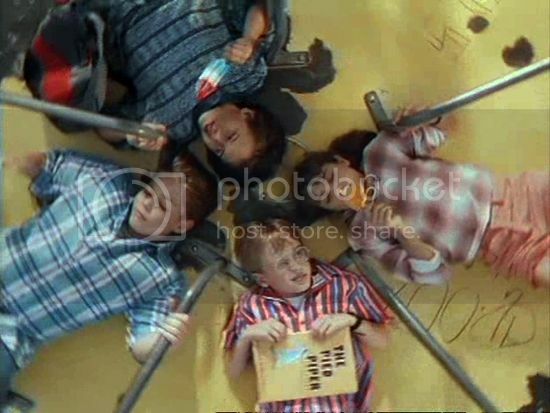 The film starts out with a kid named Gregory, who witnesses the death of the local ice cream man. This same kid is found sitting near the bloody body as he asks his mother "Who's going to bring me my ice cream, mommy?" Isn't that kid such an a-hole? The Mother didn't really give a coherent answer other than a scream of terror. I just didn't get why Gregory's concern was about his ice cream, despite the lifeless body in front of him. Umm...ok! If I was his mother, I would have been aggravated that my kid was such a greedy fatty, who only cared about ice cream and not the kind-hearted, local ice cream man. Anyway, the kid is committed to a horrible sanitarium where he has to endure electric voltage shocks, injections with giant needles, a random clown and worst of all an annoying laughter. Years later, to the present, Gregory grows into a creepy-looking man with colossal eyes and a diastema smile. He is the Ice Cream Man! Yep, he's the balding man driving around in a filthy truck, serving eyeballs in ice cream and murdering people. Gregory becoming the local ice cream man makes no sense to me. Seriously he saw his local ice cream man murdered and lying in a pool of blood. Does that make him want the same life? Well, whatever. Anyhow, one day a kid from the neighborhood ends up dead so a group of kids who call themselves "The Rocketeers" suspects Gregory, the ice cream man so they decide to take the law into their own hands! The Rocketeers consist of four different types of stereotypical kids: a cool kid with perfect hair, a nerdy, scrawny kid with glasses, a chubby kid who's actually not chubby at all because he has a pillow in his shirt and a girl who likes hanging out with boys. I wonder why none of the film crew thought to hide the pillow. The Rocketeers ride their bicycles in the middle of the night trying to solve the mystery of the murdered kid. Annoyed, Gregory with his masturbating hands kidnaps one of the kids. Can you guess who? If you guessed the scrawny kid with glasses, you're right! Instead of killing the kid, Gregory teaches him how to make ice cream. Although the kid is living in an abandon building and sleeping on half of a mattress, they have some kind of bond. [SPOILER!!!] At least until the night Gregory gets careless, lets his guard down, and the kids push him into the giant ice cream blender, pureeing him to his death. [/SPOILER!!!] The whole film consisted of the Rocketeers running around getting into more shenanigans and saying repeatedly throughout the film "Oh no, guys, the ice cream man is creepy and he's murdering people!" or "GUYS, how are we going to stop the ice cream man?!" Although this film was ridiculously terrible I don't mind watching it for laughs! It did have great, unique kills. Furthermore, this film is labeled a comedy horror, I'm 100% sure this film was not meant to be a comedy! 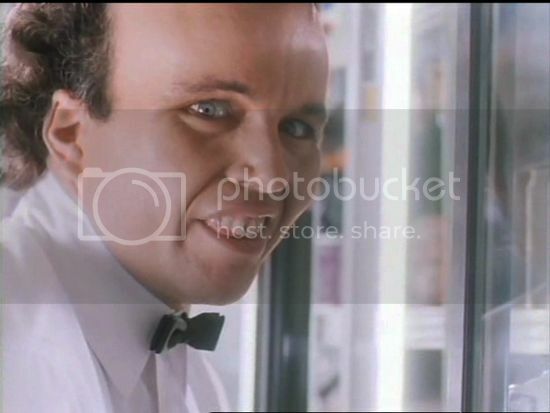 Plus, I know that Clint Howard was just playing the role of Gregory but honestly, I wonder if he actually drives around a filthy ice cream truck, creeping kids out and touching ice cream in such a sensual way. The film concludes with the kid who was kidnapped is now home. Happy ending right? No. He's in the corner of his room making ice cream and smiling at the camera. Whatever. Overall, if you want to laugh or you absolutely have nothing to watch, I say give it a go! Some people actually consider this film a cult classic, which I don't get but ok! Oh such a classic so-freaking-terrible-it's-good movie! 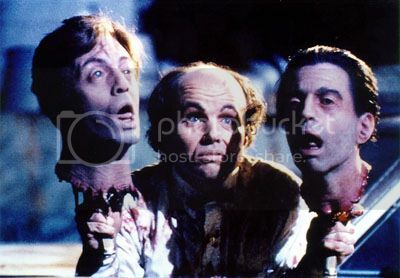 Clint Howard at his best... er, worst! Of course this movie is only good for laughs. I loved how they made the fat kid fat by just lazily putting a pillow or padding under his clothes - just adds to the absurdity.